The psychological muscle of character is moral conduct, not to speak of self-discipline. Its bedrock? The ability to defer gratification — to control and channel one’s urges to act — the very purpose of motivation, whatever one’s occupation. And, for Rajkumar, Kannada cinema’s first and, perhaps, its last superstar, cinematic excellence has always meant more than conviction — a worship of art, and not merely management of one’s perception of acting talent, qualities, or premise. Rajkumar’s tinsel career is as old as the hills — a culmination, or reflection, of the veteran actor, producer, philanthropist, and singer’s phenomenal exploits on the silver screen. It’s a reminder that the septuagenarian’s popular chemistry has held its own status, charisma, sensitivity, sentiment, and affection among the masses. As one who brought fulsome, or wholesome, respectability to Kannada cinema, at a time when it was not well known outside of Karnataka State’s borders, Rajkumar, for all practical purposes, is a demi-god. He is worshiped by a legion. He’s a gentle giant, or ‘do-gooder’ — both on and off the screen. 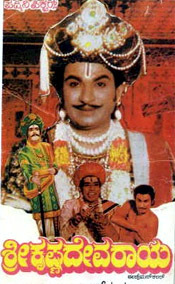 Rajkumar’s acting has always been purposeful, and the ease, effect, and grace with which he projected his roles, both varied and commonplace in the Indian context, and ‘shout-lines’ of his speech, albeit a wee bit theatrical, thanks to his early lessons on the stage, are simply astounding. Although he has now changed over to playing an occasional character role, Rajkumar in his halcyon days, had the natural ability to fit into any role — from a celluloid Krishna, and down-to-earth common man, to a flashy James Bond. Hailing from Gajanur, a small hamlet, Rajkumar’s talent has a genetic element. His father was a doyen among stage actors — a fire-brand of sorts. His life was totally devoted to the stage — nothing beyond paint, and make-up. Rajkumar’s father did not also acknowledge the proviso of a good education. Characteristically, he only fostered his gifted son, the young Muthuraj — Rajkumar’s real name — to take interest in drama and plays, and also sing. Many of Rajkumar’s films have seen the jubilee mark, they still do… even on re-runs. In select instances, his films have run to packed houses for several months, even one or two years. Nostalgia has it that every Rajkumar starrer, on the day of release, used to unleash a festive flavor of color and splendor, at different centers, all over Karnataka. Until the late 1980s, it was not uncommon for one to witness stampedes following frenzied fans’ emotional paroxysms to getting tickets. While some centers, or most of them, used to become a Mecca for black-marketers, with tickets sold in multiples, or even more fanciful rates, Rajkumar, perforce, mindful of the hazards his fans were often subject to, seldom disappointed them. Rajkumar is everyone’s hero — he has identified himself with the common man, not the elite, even though his cultured presence on the screen appeal to the most sophisticated. This is his stamp. And, his tour de force in films such as “Hannele Chiguridaga,” “Kasturi Nivasa,” “Uyyale,” “Eradu Kanasu,” “Bhakta Kumbhara,” “Babruvahana,” and “Shankar Guru,” in which he played an unforgettable triple role, to mention just a few, will be remembered for a long, long time to come. More so, his magnum opus, “Bangarada Manushya” — a sensitively structured, family story, with popular motifs, which ran to packed cinema halls, in Mysore and Bangalore, for over two years. Years later, the movie, on a re-run, achieved another distinction: with an ‘innings’ of one year, in Bangalore. Even though Rajkumar is now only a shadow of the vibrant persona of the 1960s and 1970s, dissimulated with the alleged wayward ways of his actor-sons, there is more to him than what meets the eye, or by way of his domineering presence on the screen. That he has not taken the plunge into politics a la MGR and NTR is a reflection of his self-control. A man devoid of scandals — albeit he was in the picture of a major storm, thanks to his now –(in)famous kidnap drama, ‘engineered’ by the vanquished sandalwood and forest brigand, Veerappan. All the same, in his long innings in public life, Rajkumar has always been a fitness fanatic, the one-man nuclear task-force of Kannada cinema. No single actor can claim to have contributed as much as this non-archetypal box-office hero, who in the course of his ‘tenure’ may have proved to be the stumbling block to many a new aspirant. But, it goes without saying that the greatest have always been guilty of ‘promoting’ this inevitable factor of life, whatever one’s field of activity. Rajkumar has seen the best of both the worlds — from Kannada cinema’s pristine, ebullient existence to the age of neo-realism. Worse still, he’s as saddened as anybody else what with the falling standards, or lackadaisical repertoire of Kannada cinema, today. Yes, Rajkumar, who’s acted in over 200 Kannada films, and never outside Kannada films, is also a singer in his own right. That’s no big point. He’s not a bad singer — he’s good. But, it also shows his carte blanche. Because, even some of Rajkumar’s most ardent fans would grudgingly admit that had he not been Rajkumar he’d not have aspired to being a full-time crooner — one who sent his ‘ghost,’ the inimitable P B Sreenivos, the Rafi of South, into exile. All the same, success is, indeed, a sweet word, so long as it doesn’t hurt. When it does, it takes its toll in one weak moment. Guru Dutt, Meena Kumari, Marilyn Monroe et al — all creative artists — were victims of this (un)known dimension. It was once rumored that Rajkumar too was going in the same direction until his ‘inner voice’ saved him. Somehow. This is precisely the reason why he has, lately, taken such a great fancy for philosophy and spirituality — for inner harmony. Not that he was an agnostic earlier. Far from it, he was — and, still is — a man of principles, a firm believer in God. More so, because, philosophy, the exploration of the consciousness, is an examination of self. That’s exactly Rajkumar’s theme song of life, today. Some comfort this for a one-man institution, a true colossus, who’s done more for Kannada cinema than any other actor has ever achieved for the industry. Rajkumar’s basic education did not extend beyond the portals of the primary school. But, his sense of discipline, the will to learn, and an uncanny knack to go beyond academic education, have been his forte. So also his sense of versatility, and culture. He may not have been educated; yet, he’s educated. By himself. If education in any single field of specialization does not make one a complete intellectual, so does isolation. Rajkumar was in the thick of it all — films, and the world itself. His education was based on the humane context, and goodwill. Not just on the honors and awards bestowed on him — from the honorary doctorate conferred by Mysore University, Padma Bhushan, Karnataka Ratna, the State’s corollary of Bharata Ratna, the Dada Saheb Phalke Award, and a host of commendations, to whatever medals of honor that may come his way next. This is his greatness — of greatness that sits lightly on his star-studded achievements. It sums up Rajkumar, the man, and the phenomenon — a genius with an infinite capacity for taking pains to mastering his art. In his job, he has delved intensely in every frame of every movie he’s acted in — with rare diligence and fidelity. There wasn’t one like him before; there won’t be another like him, again.